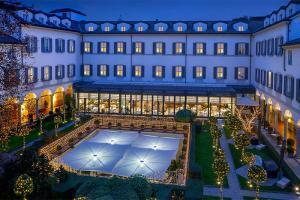 Historic elegance meets cosmopolitan flair at Four Seasons Hotel Milan. Ideally positioned in one of Milan’s coveted neighborhoods, and housed within a renovated 15-century convent, this sophisticated retreat puts guests at the center of the Fashion District's design scene and culture. Generously proportioned rooms and suites blend modern accents with period architecture with Milanese flair, surrounding you in plush luxury. The iconic Fashion Suite features its own terrace for languorous afternoons in the sunshine and dinners under the stars. Culinary highlights include Sunday Brunch, the Chef’s Table, and a decadent Chocolate Room.